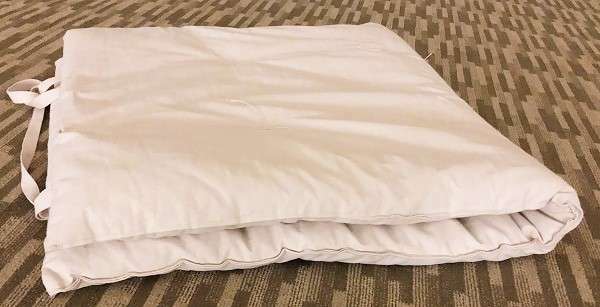 Please bring your own bedding, including a mattress if desired, as well as fitted sheet, flat sheet, blanket(s), and a standard size pillowcase (all of them white in color). A pillow and cushion if needed will be provided for each participant. Updated: The maximum space your bed may occupy is 36” wide by 72” long and the mattress should be foldable. Note: Air mattress will not be conducive for use during the program. Hence it is not recommended. An option similar to the below photo is recommended. All items used in the hall must be white or covered in white. 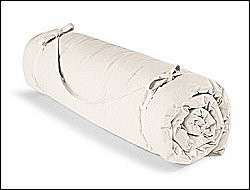 When packing your “mattress,” one option would be to bring a white duvet cover which could be filled with the material of your comfort, such as a sleeping bag, mattress topper, or thin/thick cotton mattress. Any of these can be used which does not exceed these dimensions. Proper covering is necessary. Even if the mattress is turned over, no color should show. No sharp objects inside Mahima, including pins. No tape inside Mahima on the carpet.